Actor Raghava Lawrence's Motta Siva ketta Siva movie released today, In this film title card mentioned as "Makkal Super Star", this only creates many conversions. But Raghava Lawrence released the press statement about this title card, like this title card created by movie director as a suspense manner. Today only I saw this title card in my movie. Hope you are all enjoying the movie Motta Shiva Ketta Shiva. The Director had told me that he would spring me a big surprise in the movie. Today it was a huge surprise to see the title 'Makkal Super Star' in my name in the movie. I would like to state that I do not feel I deserve this title and I can only say that there is and can only be one super star and that is our Thalaivar Rajinikanth. I am a huge fan of Super Star Rajinikanth. It is he who introduced me to this film industry. And I first saw my Raghavendra Swamy in him. I am absolutely grateful to him in every way. I will forever remain a fan of him. I have chosen my own title for my name and it will be that of my mother. I will henceforth be called Kanmani Raghava Lawrence in my forth coming movies! Nothing can bring me more happiness than my mother's name. No title can be equal to this! 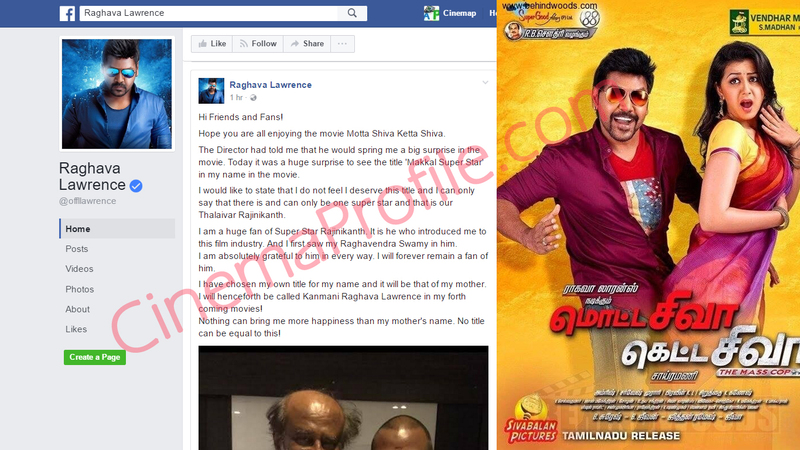 Write & Share about "Raghava Lawrence Title card creates Issues? : Makkal Super Star | Motta Siva Ketta Siva Tamil Movie News | Cinema Profile" !